1) In The Summertime went to No.1 in the singles charts in 26 countries. Estimated worldwide sales to date in excess of 30 million units. 2) Ray Dorset worked at Timex and had to ask his boss for the afternoon off work to perform on Top Of The Pops. 3) In The Summertime is the third best selling single of all time (worldwide sales), # 1 is Bing Crosby White Christmas (source Wikipedia). 4) It topped the charts in the UK (a record seven weeks), also number one in Australia, Austria, Belgium, Canada, Denmark, France, Germany, Ireland, Italy, Netherlands, New Zealand, Norway, South Africa, Sweden, Switzerland amongst others. 5) Interestingly it only reached number 3 in the US Billboard Hot 100, but the new version by Shaggy released in 1995 went to number one in this chart. Shaggy’s version included approved samples of Ray Dorset’s original vocal and guitar. In The Summertime did however reach number one in the less recognised US World Record Charts. 6) YouTube contains footage of the first two video recordings made of In The Summertime, the original from which the footage was only found in recent years by chance by Ray Dorset has had over 53 million hits and the second the Hyde Park recording has over 60 million hits, others including the German Beat Club video total over 2 million hits. It won’t be long before YouTube will have had a staggering 120 million hits by fans of In The Summertime. 7) Often asked about the lyrics to In The Summertime, does he sing “We go sailing” or “We go swimming in the sea”? Ray Dorset explains “I sing both, on one channel I sing sailing and the other I sing swimming, the vocals were double tracked”. 8) The authentic rocker, Baby Jump was Mungo Jerry’s second consecutive number one single. 9) Lady Rose reached number five in the UK singles chart, despite being banned by the B.B.C and taken off sale. 10) You Don’t Have To Be In The Army To Fight In The War, was Mungo Jerry’s fourth UK hit in the maxi-single format and the name of the soon to be published book of Ray Dorset’s life story. 11) Alright Alright Alright reached a UK chart high of number three. 12) In total, Mungo Jerry has had eight UK chart singles, plus another seven non-UK chart hits around the world. 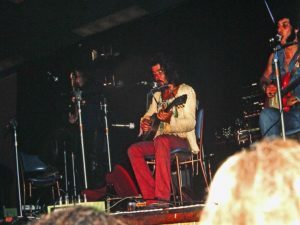 13) Ray Dorset used his own recording studio for the classic blues album, A Case For The Blues which featured Ray and blues legend, Peter Green. 14) Kelly Marie’s version of Ray Dorset’s Feels Like I’m In Love was also a UK number one single, making Ray one of the elite band of songwriters who have written number one hits for themselves and other artists. 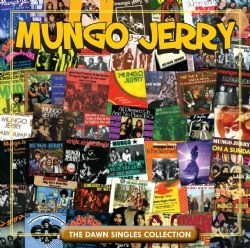 Available through CHERRY RED RECORDS, is a collection of all of the A and B-sides of all of Mungo Jerry’s singles for the highly collectable Dawn record label, including the muti-million seller, In The Summertime, Baby Jump, Lady Rose, and more.